The 1926 Toronto Maple Leafs. The Globe, October 2, 1926. Between 1919 and 1925, the Baltimore Orioles dominated baseball’s International League. Thanks in no small part to the machinations of their determined manager, Jack Dunn, the Orioles won seven consecutive pennants, averaging 111 wins over seasons that featured anywhere between 150 and 166 games. 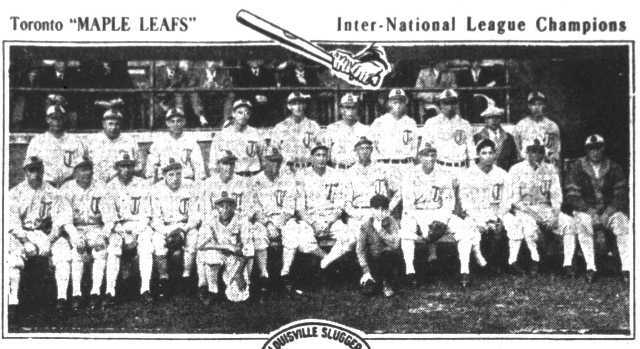 Finally, in 1926, the Orioles were bested by the Toronto Maple Leafs, who finished the season 109-57, eight games ahead of Baltimore, thereby earning a spot in the Little World Series against the Louisville Colonels. In the early 1920s, minor league baseball teams did not yet have firm affiliations with specific major league teams as they do today. Jack Dunn operated the Orioles as an independent team, doing his best to retain his top players, and occasionally selling a rising star to an interested major league team. Many other teams in the league had relationships with major league teams, wherein the big league club could assign a player to the minor league team for further development. Toronto had such a relationship with the Detroit Tigers, and many of the players who passed through Toronto in the 1920s went on to play at the major league level for Detroit. Even on the Maple Leafs, however, many of the players had no contract with a major league team, although players who performed well might be drafted by a major league franchise at the end of the season. 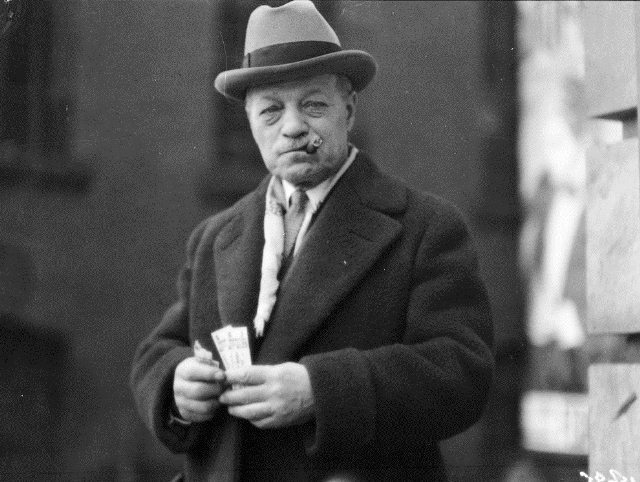 The incredibly photogenic Toronto Maple Leafs’ owner Lol Solman in 1929. City of Toronto Archives, Fonds 1266, Item 15695. In Toronto, however, baseball’s popularity was growing. In 1925, Toronto finished in second, just six games back of the Orioles. Indeed, in the seven years that Baltimore dominated the International League standing, Toronto had only one losing season and averaged an impressive 92 wins a year. Prior to the start of the 1926 season, Leafs owner Lol Solman had financed the construction of Maple Leaf Stadium, a 23,500-seat venue at the foot of Bathurst, enabling him relocate the Leafs from their previous home at Hanlan’s Point Stadium. The new stadium, combined with a competitive team, saw Toronto draw 221,846 fans in 1926, a team record which stood for more than two decades. This record is especially impressive considering that most 1926 Toronto home games started at 3:30 or 4:00, as the team did not install light stands permitting evening play until 1934. The key to the Leafs’ success in 1926 lay in its pitching corps, which, in addition to being highly talented, was also extremely deep. Lefty Stewart, who had won more than 20 games in each of his previous two seasons with Toronto, turned in another strong season, finishing the year 18-9 with a league-leading six shutouts, and leading the team with a 2.99 ERA and 1.202 WHIP. The Leafs’ winningest pitcher was young Tigers prospect Ownie Carroll, who came to Toronto following a sensational career at Holy Cross College, where he went 50-2. Although Carroll struggled a bit with his control in 1926—he walked as many batters as he struck out—he led the Leafs with 39 starts and finished with a 21-8 record. Lefty Faulkner and right-hander Jess “Slow Motion” Doyle also earned 15 wins for the Leafs, giving the team four dependable starters throughout the season. Toronto’s pitching staff was further improved midway through the season by the addition of bespectacled Tigers prospect Vic Sorrell, who joined the team after graduating from Wake Forest University. Sorrell made 20 appearances for the Leafs in 1926, compiling a perfect 8-0 record, with an ERA of 3.06. Struggling for playing time was another Tigers pitching prospect who worked mostly out of the bullpen for the Leafs. The prospect was Carl Hubbell, who showed little indication of the remarkable career that was ahead of him. Hubbell had developed a pitch known as a screwball (or “fadeaway”), in which the pitcher twists his arm away from his body as he throws, causing the ball to curve in the opposite direction of a curveball. Detroit’s management, worried that the unusual arm motion associated with the screwball would damage Hubbell’s arm, forbid him from using it. Hubbell complied with the Tigers’ orders and, without his top pitch, was less effective than most of his teammates; he finished the year 7-7 with an ERA of 3.90, one of the highest on the team. Babe Ruth in action at Maple Leaf Stadium. The Toronto Star, September 11, 1926. 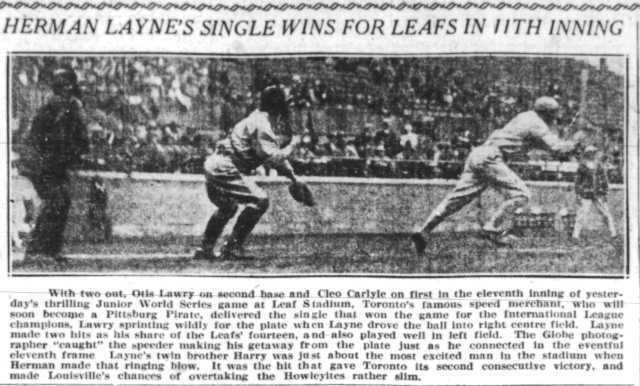 On offence, the team was not blessed with power, relying more on speed and “small ball.” Outfielder Cleo Carlyle led the team with 14 home runs, and first baseman Minor “Mickey” Heath was the only other Leaf to hit 10. Most runs were manufactured through singles, stolen bases, and sacrifices. Outfielder Herman Layne led the team with 32 steals and led the league with 16 triples. Veteran outfielder Frank Gilhooley, nicknamed “Flash” because of his speed, usually hit leadoff and led the team with 118 runs. Third baseman Bill Mullen led the team with a .357 average, and slick-fielding shortstop Otis Miller hit .348. The Leafs’ weakest position was undoubtedly second base, as the team was unable to replace the powerful bat of Charlie Gehringer, who, after tearing up the International League in 1925, established himself as Detroit’s starting second baseman in 1926, on his way to a Hall of Fame career. 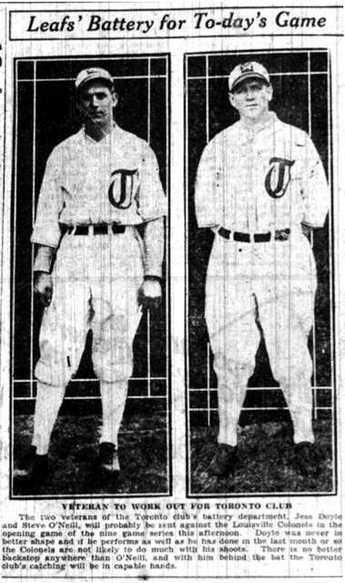 Light-hitting Carl Schmehl and Otis Lawry took turns at second base for the Leafs, while Steve O’Neill and utility player Lena Styles split the catching duties. The Maple Leafs’ manager was “Dapper” Dan Howley, who likely earned the nickname not because of his appearance, but because of the resemblance of his name to that of Dapper Dan Hogan, a famous Prohibition-era gangster from Minnesota. Described in one Star article as “a big upstanding Irishman with a booming voice and inexhaustible fund of anecdote,” Howley was serving his second of four stints as the Leafs’ manager, and predicted big things from the Leafs in 1926. The team got off to a sputtering start, however, and after briefly holding the top of the standings they were supplanted by Dunn’s Orioles in June. Leafs’ manager Dapper Dan Howley. The Toronto Star, August 23, 1926. Over the final two months of the season, Howley’s Leafs played all out, showing a fighting spirit in their quest for the pennant. In a game against the Orioles on August 6, both of the Leafs’ regular catchers, Steve O’Neill and Lena Styles, were ejected, forcing infielder Carl Schmehl to play behind the plate when the game went into extra innings. 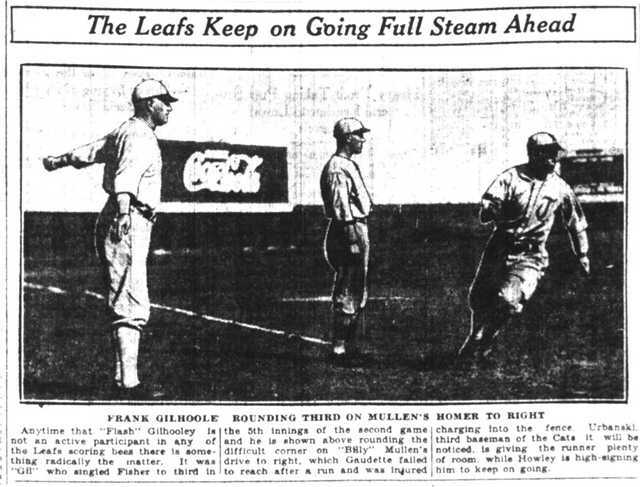 The Star noted that “although whatever [Orioles] players got on ran wild, none got as far as home plate, thanks to the effectiveness of [Vic] Sorrell who pitched the last four innings.” The weak-hitting Schmehl hit a sacrifice fly in the eleventh inning to score Flash Gilhooley, bringing the Leafs within two and a half games of the league lead. Frank “Flash” Gilhooley rounding third. The Toronto Star, August 25, 1926. 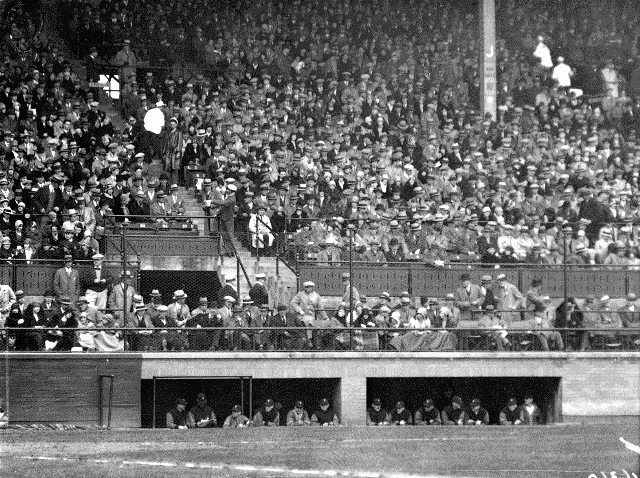 Dugout at Maple Leaf Stadium, 1929. City of Toronto Archives, Fonds 1266, Item 16360. 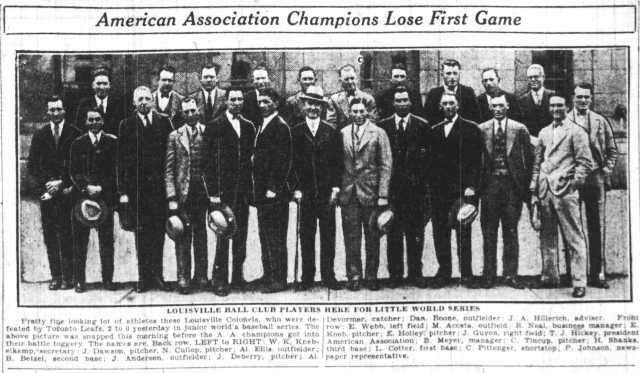 The 1926 Louisville Colonels. The Toronto Star, September 29, 1926. Hits were somewhat more plentiful in Game Two, but scoring remained low. The Leafs found themselves trailing 2-0 going into the bottom of the ninth, but managed to load the bases with three singles. With one out, Bill Mullen hit yet another single into left field, scoring Lena Styles from third as well as pitcher Ownie Carroll from second, who managed to slide in ahead of the throw. Carroll pitched a brilliant game, striking out thirteen, including the rare feat of striking out four batters in one inning, after one of the Colonels was able to take first when the strikeout pitch got away from catcher Steve O’Neill. Howley stuck with Carroll as the game went into extra innings and earned the win in the eleventh when Herman Layne hit a single to the outfield, scoring second baseman Otis Lawry. Game Three also went into extra innings, as each team only managed a single run through nine innings. In the bottom of the 10th, with Mullen on second, Otis Miller hit a ground ball through the legs of the Louisville first baseman. According to the Globe, “Mullen was away with the crack of the bat, and when catcher [Al] DeVormer crowded him, Mullen side-stepped, tripped over the plate, and lay there in agony, having painfully injured his knee. He was carried to the dressing room by his teammates, but stated that he will probably be able to play in tomorrow’s game.” Despite spraining his knee, Mullen had scored, giving the Leafs a three-game lead in the series. 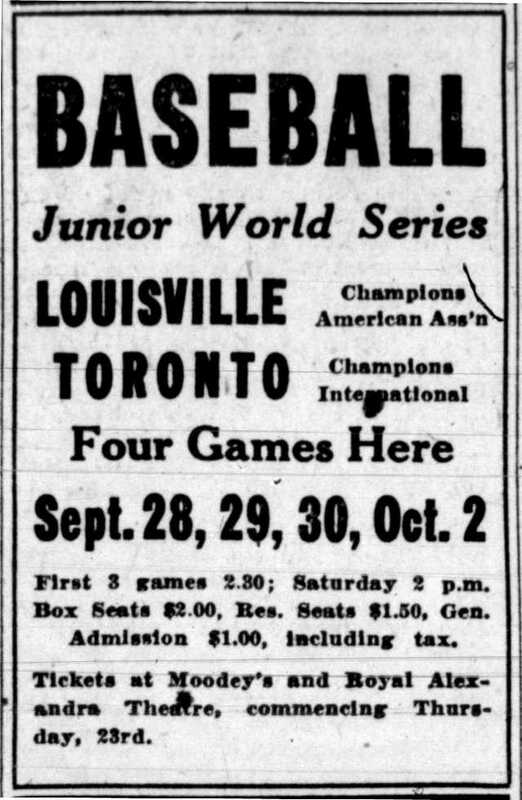 Advertisement for the Junior World Series. The Globe, September 22, 1926. Mullen missed Game Four in favour of utility player Carl Schmehl, but the Leafs managed to eke out another victory, 4-3. In a rematch between Jess Doyle and Ben Tincup, both pitchers proved more vulnerable than in Game One. Doyle surrendered three runs in the fifth and was lifted in favour of submarine pitcher Red Fisher, who held the Colonels hitless for the remainder of the game. One of the Leafs’ runs came by way of first baseman Mickey Heath, who hit the only home run for either team in the series. Following news of the Maple Leafs’ victory, Toronto City Council passed a resolution authorizing mayor Thomas Foster to send a letter of congratulations to both Lol Solman and Dan Howley, although a proposal that the City also award gold medals and hold a civic dinner for all the players of the team was rejected by the Board of Control. Herman Layne’s winning hit in Game 2. The Globe, September 30, 1926. Within a few weeks of the Little World Series victory, it was clear that the team would look quite different in 1927. 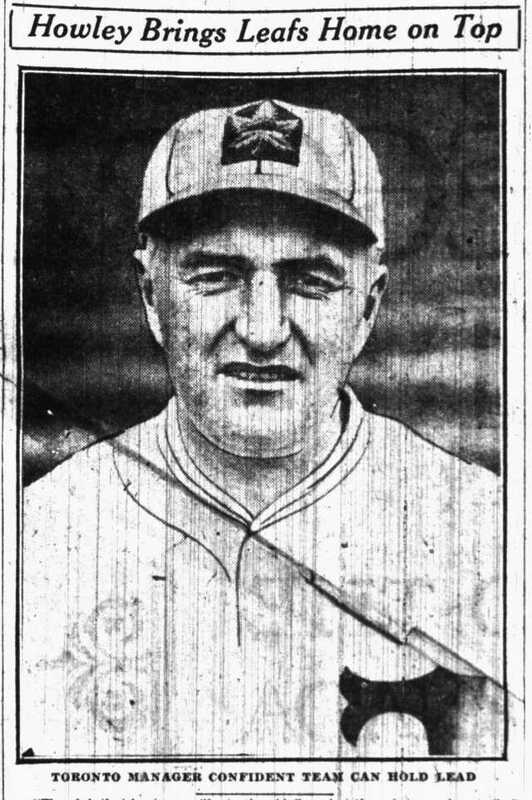 Even before the season had ended, there were rumours that Dan Howley would be offered a job with a major league club, and in early November he was named as the new manager of the St. Louis Browns; Howley found space for both Lefty Stewart and Otis Miller on the Browns roster. Herman Layne was sold to the Pittsburgh Pirates, while the Tigers promoted Ownie Carroll. The Tigers assigned Carl Hubbell to a lower minor league team in Decatur. Midway through 1928, Hubbell grew tired of being held back by Detroit, and threatened to quit professional baseball unless the team released him from his contract. Later that year, he signed with the New York Giants. Permitted by the Giants to throw his screwball, Hubbell flourished, becoming one of the game’s most dominant pitchers. Hubbell won 253 games over 16 seasons in the major leagues, earning two MVP Awards. 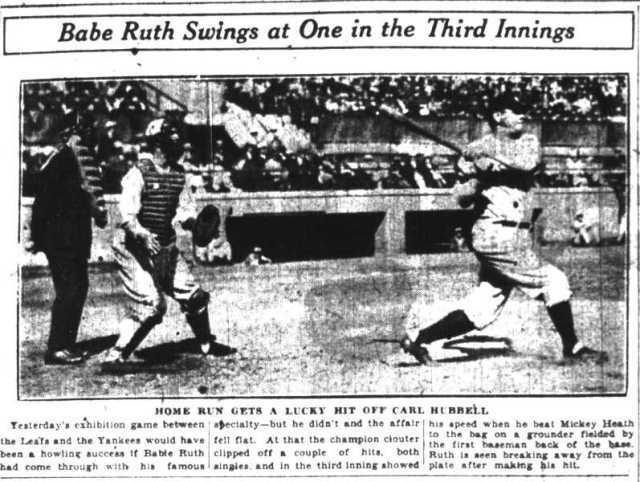 In Game One of the 1933 World Series, Hubbell threw a five-hit complete game against the Washington Senators. The losing pitcher for the Senators was his old Toronto teammate, Lefty Stewart. Additional material from: Lowell L. Blaisdell, Carl Hubbell: A Biography of the Screwball King (McFarland, 2011: Jefferson, North Carolina); Louis Cauz, Baseball’s Back in Town (Controlled Media Corp., 1977: Toronto); Donald F. Chrisman, The History of the International League (1919–1960) Part I (Donald F. Chrisman, 1981); Jane Finnan Dorward, “The Fleet Street Flats” in Dominionball: Baseball Above the 49th (SABR, 2005: Cleveland, Ohio); The Globe (March 23, May 14, June 2, June 4, July 8, July 10, July 27, August 5, August 7, August 10, August 14, August 16, August 17, August 23, August 26, September 2, September 11, Septeber 13, September 14, September 22, September 23, September 27, September 29, September 30, October 1, October 2, October 4, October 5, November 4, 1926; April 27, 1927); William Humber, Diamonds of the North: A Concise History of Baseball in Canada (Oxford UP, 1995: Toronto); The Mail and Empire (September 27, September 29, September 30, October 2, October 4, October 5, 1926); The Toronto Star (May 13, June 4, August 6, August 7, August 9, August 10, August 14, August 16, August 17, August 20, August 23, August 24, August 25, September 2, September 4, September 11, September 13, September 20, September 24, September 27, September 28, September 29, September 30, October 1, October 2, October 4, October 5, October 6, November 3, December 15, 1926; March 11, 1944); The Evening Telegram (October 1, October 4, 1926); Bill Weiss & Marshall Wright, “1926 Toronto Maple Leafs” at www.milb.com; Marshall D. Wright, The International League: Year-by-Year Statistics, 1884–1953 (McFarland, 1998: Jefferson, North Carolina).